"We used to use a memory card, fill the memory card with music and listen to it from our phones," Xawa says. In her house, as she cooked and cleaned, Hassan would sing along with the great Somali singers. But even in this private space she says she was careful. "I used to turn the volume down low, so no one could hear it." For most of her life though — because of al-Shabab — this was a pretty far-fetched dream. Then in 2013 an unexpected and interesting opportunity emerged: There was going to be a new reality television show in Somalia, an American Idol-style show with singers competing. "As soon as I heard about it I knew I wanted to join," Hassan says. What she didn't know — what she couldn't possibly know — was that this reality show was part of a much larger political plan. The United Nations, which was providing the money and support for the show, had concluded that a vivid display of Somali musical culture could serve "as a kind of inoculation against the austerity of Shabab," Ben Parker told me. Parker was the head of communications for the U.N. in Mogadishu. He says that at this point — 2013 — al-Shabab had finally been pushed out of the capital, Mogadishu. But the situation in Somalia was far from stable. There were still regular attacks, so the new government (which had U.N. backing) needed to prove to Somalis that the power of the extremist group really was fading. This is why, Parker says, a musical reality show that challenged the power of the music-hating group was so appealing. 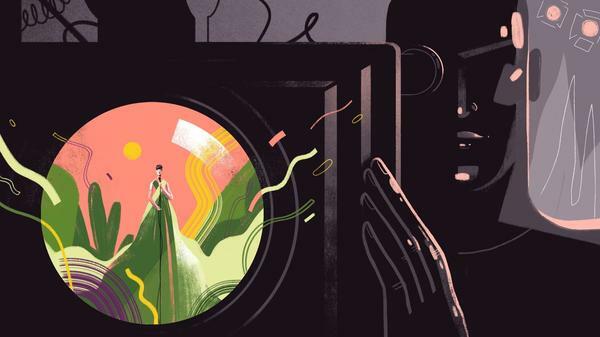 Can a reality show actually change reality? Let me repeat that: It didn't change their beliefs; it changed their behaviors by changing what they considered to be the social norm. Which brings us back to Xawa Abdi Hassan, the young woman who quietly listened to music off a memory card and dreamed of being a singer. It took her some time to convince her family that it would be OK to compete in the show, called Inspire Somalia. Her mother was afraid that participating would turn her into a target, but ultimately she got permission. Hassan says when she first took the stage to compete, her hands were shaking, and not just because this could be a big break. There was another reason: Because of al-Shabab, she had never sung in public before. "That was my first time," she says. "Before that, I did not sing in public places." NPR's podcast Invisibilia is back with its fourth season. And today they have the story of a reality show in the Horn of Africa that set out to change our culture. It led NPR's Alix Spiegel to ask, can telling a certain kind of story create a new reality? ALIX SPIEGEL, BYLINE: Once upon a time there was music on the radio, but then the music started fading out. First one radio station, then another, then another until there was almost no music to hear and people started MacGuyvering workarounds. One of the people who came up with a workaround was Xawa Abdi Hassan, a young woman who lived in a village outside Mogadishu, Somalia. XAWA ABDI HASSAN: (Through interpreter) We used to use a memory card, fill the memory card with music and listen to it from our phones. SPIEGEL: In her home, as she cooked and cleaned, Xawa would sing along with the great Somali singers. But even in this private space Xawa says she was careful. HASSAN: (Through interpreter) I used to turn the volume low so nobody hears it. SPIEGEL: The problem was al-Shabab, the Islamic extremist group that dominated large parts of the country. They didn't like music. In 2009, they banned music at weddings, banished musical ringtones. Then at some point I guess they figured best to go straight to the source, so extremists started targeting the musicians themselves. The Soloist Aden Hasan Salad was shot and killed in a teashop. Others were murdered in the street. But through all of that Xawa kept listening and practicing because Xawa had a dream. HASSAN: (Through interpreter) I just wanted to sing and become an entertainer. SPIEGEL: For most of her life, though, because of al-Shabab that was a pretty farfetched dream. But then in 2013, an unexpected and interesting opportunity emerged. Apparently there was going to be a new reality television show, an "American Idol"-style reality show. Xawa says she instantly knew she wanted to join even though she had to admit the idea really worried her. Can she explain? What was she worried and afraid of? UNIDENTIFIED INTERPRETER: (Foreign language spoken). SPIEGEL: What Xawa didn't know, couldn't know, is that this reality show, it was part of a much larger political plan. BEN PARKER: Yes, it was sort of inoculation, you know, against the temptations of al-Shabab's austerity. SPIEGEL: This is Ben Parker, who was director of communications for the U.N. in Mogadishu at the time. It was the U.N. that was behind the show. They provided the support and money. See, in 2013, though al-Shabab had finally been pushed out of Mogadishu, the situation in Somalia was far from stable. There were still regular attacks. So the new government, which had U.N. backing, needed to prove to Somalis that Shabab's power really was fading, which is why a musical reality show that challenged the power of the music-hating group was so appealing. PARKER: The beauty of the reality show is that the form itself achieves some of your goals. SPIEGEL: After all, not only was there music, there was Democratic voting, individual expression. So even in its form it communicated to its audience a very different kind of being. So can a reality show actually change reality? BETSY LEVY PALUCK: I am very interested in how we make the normal. SPIEGEL: How do people come to see the world around them as normal, an unremarkable fact, the way things are and should be? Betsy Levy Paluck is a psychologist at Princeton University who studies media and how societies change. And she says that for a long time, people assumed that the path to political change depended on crafting the right argument. PALUCK: It was all rhetoric and no poetic. SPIEGEL: But starting in the '90s, Betsy says, poetic started gaining ground because psychologists realized that people consumed stories in this qualitatively different way. PALUCK: Their defensiveness is disabled. Their counterarguing is at rest. PALUCK: What it boiled down to was that despite the fact that people loved this program, it didn't change their beliefs. But it did change their perceptions of norms. And at the same time, it changed their behavior. SPIEGEL: It didn't change their beliefs. It changed their behaviors by changing what they considered to be the social norm. For example, people who listened to the program were way more cooperative when dividing up valuable resources, even when they had to divide those resources across ethnic lines. It absolutely moved the needle, which is a sobering idea. PALUCK: We like to think that all of our behaviors flow from our convictions and what we do is a reflection of who we are and what we think. But we're constantly tuning ourselves to fit in with the social world around us. SPIEGEL: So what this work suggests is that if you change someone's perception of what constitutes the social norm - like, you convince people that the world is safe enough to sing in public even though in actual fact singing in public is incredibly dangerous - then you just might be able to move the needle on the ground. HASSAN: (Singing in foreign language). SPIEGEL: Which brings us back to Xawa, the young woman who quietly listened to music off a memory card and dreamed of being a singer. She says when she first took to the stage to compete in the show, which was called "Inspire Somalia," her hands were shaking. HASSAN: (Through interpreter) Yeah, that was my first time. Before that I did not sing in public places. SPIEGEL: After Xawa, two other contestants had their turn, both men. One had a famous musician father. The second, Mustafa, had composed his own song. MUSTAFA: (Singing in foreign language). SPIEGEL: When they finished came the part of the show that was supposed to serve as a democracy demonstration. Ballots were distributed to the audience and judges. And for a minute the room was quiet as they marked the papers in their laps. SPIEGEL: Mustafa ended up winning. But Xawa says she was honestly not upset. For her, just the act of singing in public for the first time was enough. HASSAN: (Through interpreter) I was very happy. I was happy as, like, I was born that day. SPIEGEL: Somalia continues to struggle with attacks by Shabab. But there's at least one undeniable change since 2013. Music is back in the streets, brought back slowly and painfully through a combination of political strategy and personal courage. Alix Spiegel, NPR News. Transcript provided by NPR, Copyright NPR.